Ask fellow campers about "Gray Homestead Oceanfront Camping" and nearby attractions. This is a rural campground on Southport Island just south of Boothbay Harbor. It does stretch the limits of "big rig friendly" and they don't have sites for anything larger than our 40' MH. The roads and sites are gravel and some people may find them challenging. The views from some of the sites are exquisite but those are rented on a seasonal basis. The overnight sites have no views but the beach is just a short walk. There are picnic tables and chairs at the beach as well as rental kayaks. Verizon 4G service is excellent. The owner is friendly as are the office staff. We camped at Gray Homestead Oceanfront Camping in a Motorhome. I had read reviews about the owner that concerned me. but he was very pleasant and helpful. We were supposed to be stay for 2 weeks but left early because of Irene. It is a beautiful and clean campground. The coast of Maine is spectacular. We camped at Gray Homestead Oceanfront Camping in a Travel Trailer. This is a great campground if you are looking to purely camp. There aren't any activities, no pool. But the views from down at the beach can't be priced. And being able to get lobster right at the campground was the best. My husband and I would certainly return the next time we get to Maine. We camped at Gray Homestead Oceanfront Camping in a Travel Trailer. Campground is NOT oceanfront! There were a few sites near the rocks that lined the casual definition of 'oceanfront.' Rocky, sea-weedy, had an ancient pier, pay showers and narrow turns. This small park was very nicely landscaped with trees and flowers but sites were small and rocky. This is a good overnight spot, but not for enjoying the oceanfront. We camped at Gray Homestead Oceanfront Camping in a Travel Trailer. We had an ocean view and it was worth it. We met so many nice people. The sites are a little tight but worth the view. The ride into town is a ways, so I would recommend stocking up first. This is one RV park you should visit. We camped at Gray Homestead Oceanfront Camping in a Motorhome. My family and I love this place and have been here twice for a week. It is a true "Downeast" Maine experience for us and the vistas are spectacular. It not real conducive to big rigs, but most manage. I did see one Class A almost take down a tree but they finally got in. There are no pull throughs and the waterfront sites don't have sewer. The bathrooms are clean and showers cost a quarter, but that was definitely enough. The only thing you can buy at the office is ice or fire wood, otherwise you have to drive into town and it's a few miles away. They will get lobsters for you at a reasonable price and cook them for you for $4. If you drive a couple miles down to the fish market they cook them for free. This is a quiet place with no planned activities, but fishing off the dock is great. Star gazing at night can be amazing. The area has lots of interesting things to do for day trips, but what is touted as a beach at the campground really isn't much of a beach experience if that's what you want. This is Maine. The caretakers here were very nice. I'm always sad to leave here and have every intention of returning. We camped at Gray Homestead Oceanfront Camping in a Travel Trailer. A small campground with a few ocean front sites, some ocean view sites and other sites that were shaded in the woods. Nice quiet campground. We stayed two nights. There is a laundry although we did not visit it. You can get a taxi to town for $10 which is cheaper than parking in Boothbay Harbor. You can order lobsters in the campground and they will cook them for you. I would return. We camped at Gray Homestead Oceanfront Camping in a Motorhome. This was the 2nd time that we had camped at Grey's. We stay right on the ocean and the views are spectacular. Before we left, we made our reservations for September, 2010. For any of the ocean view sites, you either have to book one year in advance, or, I guess get extremely lucky. The sites are a little tricky to get into, but well worth it. Owners are very nice. We will go back every year. We camped at Gray Homestead Oceanfront Camping in a Fifth Wheel. I had one of the excellent, newer, premium sites. High on a hill, overlooking the entrance to Boothbay Harbor - there's lots to watch. VERY difficult to reach the site - cars at rental cabins in the roadway - turns and trees - but, I made it. Beach front sites have no sewer. Dock and small beach are definitively "Maine" and lovely! If THAT is what you're looking for, you'll love this place. Sites away from the water aren't so great, but I loved my stay. We camped at Gray Homestead Oceanfront Camping in a Motorhome. We spent two nights here on an oceanfront site. It's true that the site is oceanfront, but it's not exactly ocean friendly. Next time we would choose a site up in the wooded area that overlooks the ocean and has some really cool rocky and shaded sites. This campground is definitely not for larger trailers or motor homes and could be very difficult to maneuver around corners and large pine trees, especially if it's been raining. The restrooms were very clean and the staff was friendly. The drawback with the showers is that they are still coin operated after paying the expensive site fee and are a hike from the oceanfront sites. We would come back, but camp in one of the wooded sites versus the oceanfront sites which are overrated and tight. We camped at Gray Homestead Oceanfront Camping in a Tent Trailer. This is a campground, pure and simple. It is not a fancy RV park with concrete, TV cable, etc. We stayed for three nights on the ocean and absolutely were delighted. The owners were very friendly even though they were just about to close up for the winter. Our view of the bay and the ocean could not be beat. If you want someplace that is quiet, away from the crowds, and has fantastic views, ask for one of the sites along the water. We camped at Gray Homestead Oceanfront Camping in a Motorhome. This campground is rated as a family campground but in reality this campground is made for couples that do not have children. There are no accommodations for children, i.e pools,and play areas. The personnel at this campground frown upon the noise that children make while playing. The camp store is nothing more than a small room that has ice, fishing lures and pamphlets of local attractions. The campground states that it big rig friendly but the sites tell a different story. They are small, very uneven with rocks and roots all over posing a trip hazard, and are situated in a way that makes pulling into or backing into very difficult. I have a 32' TT and needed 4wd to back into my site because of the hill. The water pressure in this park is terrible to say the least. I had to fill my holding tank with water and use my pump so that I could shower and wash dishes. Some of the electric and water connections are on the other side of the campsite requiring one to use extension cords, and long hoses that add to the trip hazard. I would not recommend this campground to families and would not stay there again. We camped at Gray Homestead Oceanfront Camping in a Travel Trailer. Our stay at Gray Homestead Campground was disappointing. We payed for a full hookup, we had no water pressure. So what we did is every morning we filled the 25 gallon RV tank, that alone took about 15 minutes and then use our water pump so we could have water. The sewer connections had no caps, and our line was on top of the ground and I used 2 rocks the to keep the joints in the line from coming apart. The RV sites were not level and very difficult to get into. The roads were very rough with low branches. We had some rain and the campground turned into a mud bath and most tent sites were in standing water. If you plan on camping here with kids be prepared, the campground does not have a store or anything for kids to do. There is not a common area so if you are a tenter and it is raining you are stuck in your tent. The bath house and shower were a sad story, there were 4 showers, 2 for the men and 2 for the women. If more than 1 shower was running you had nothing but a trickle, these were also pay showers so brings lots and lots of quarters to take a short shower. So if you are looking to park your RV in this part of Maine I would check out other campgrounds. We will not come back here and we do not recommend this campground. We camped at Gray Homestead Oceanfront Camping in a Travel Trailer. Gray's is a wonderful campground for anyone who wants to "rough it" just a little. 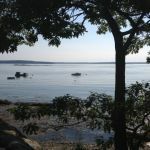 The campground is situated on 40 woody, rocky acres on the Maine coastline, just 4 miles from the town of BoothBay Harbor. Not everyone will like this park, as it has none of the amenities offered by RV "resorts". No swimming pool, no rec hall, no planned activities, just pure quiet natural relaxation, and fresh caught lobsters that you can purchase live or cooked. The park will accommodate rigs up to 42', but the sites for large rigs are limited. Ocean view, read oceanfront, sites are also limited. If you want to camp in this beautiful park, I highly recommend making reservations as far in advance as possible. We camped at Gray Homestead Oceanfront Camping in a Motorhome. Quiet and small, this campground is really nothing more than a wooded section of land near the water. Very rocky coast with nice view of harbor and lobster boats. Nothing to do however with no facilities and a complete muddy mess if it's raining. We were in a 28' MH and almost got stuck in the mud. Bathrooms were poorly lit and filthy. Anything larger than our rig would have had much trouble manuevering in this park. We camped at Gray Homestead Oceanfront Camping in a Motorhome. Are you affiliated with Gray Homestead Oceanfront Camping ?